Welcome to the Alps! The Tour moves into France's highest mountains, and finishes up in Italy, atop Prato Nevoso for the first time. The elements are in place for another exciting stage, as Valverde and Cunego sit far enough back that they may be given some slack on the final slope, while Fränk Schleck can move into yellow if he can pull more than a single second back on Cadel Evans. It's a rainy day at the start, and the stage starts uphill almost immediately, up to 9,000 feet on the hors categorie Col Agnel, whose summit comes 58 kilometers from the start. We've got two intermediate sprints, and wind up with a 3rd category climb as a warmup to the 1st Category climb to Prato Nevoso. In the U.S., Versus offers wire-to-wire live coverage, and Johan Bruyneel will be joining the commentary team. Team Columbia's Mark Cavendish has called it a Tour, resting up for his Beijing Olympic races. The day's first successful breakaway is Danny Pate, José-Luia Arrieta, and Egoi Martinez. They collected the day's first sprint points, then were joined by Simon Gerrans of Credit Agricole. The four leading riders are about 3:30 ahead of the field with almost 25 kilometers ridden. On the first climb, the gap continued to go out, to almost 14 minutes, before Lampre put some men on the front, and began to put a dent in the lead. Two more riders abandoned on the climb -- Mark Renshaw of Credit Agricole, and QuickStep leader Stijn Devolder, whose performance is among the bigger (non-pharmaceutical) disappointments of this Tour. On the descent into Italy, the gap continues to fall, now a little more than 11 minutes, then went out a bit as riders began taking nature breaks in advance of the feed zone. Voeckler continued to ride ahead of the field, on a quixotic solo attack that seemed unlikely to close down the 10+ minute gap. On a hairpin with around 90 kilometers to ride, Oscar Pereiro went over a guardrail at the top of a hairpin, landing on the road below, and fractured his femur and collarbone. He was taken away in an ambulance. 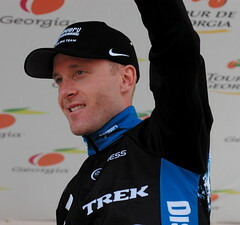 Pereiro was awarded the 2006 Tour win when Floyd Landis was disqualified for doping. The gap went out to more than 16 minutes as the peloton's pace fell after the accident. At the day's second sprint, the gap was more than 17 minutes. The breakaway appears likely to succeed. Pate hasn't established the climbing bona fides of the other three, and has been gapping slightly on the climbs so far. CSC-Saxo Bank has moved to the front, and on the Colle del Morte, set a pace high enough to split the field. Will they be able to launch Schleck to yellow? Or will Carlos Sastre deliver their final punch? You can follow my updates in near real-time on Twitter. Today is the Tour's hardest stage, so far, with two 3rd Category climbs, then a 4th Category, and finally the 1st Category Col de la Colombiére, whose summit comes about 15 kilometers/9.3 miles from the finish. It's Bastille Day, as well, so many of the French riders will be angling for the stage. Christophe Moreau looks like a favorite for the stage win to me. Oscar Freire of Rabobank and Rubens Lobato of Saunier Duval didn't take the start this morning. Enrico Degano, who was reported out of the race yesterday, actually finished 16th yesterday and took the start, but has already abandoned on the course. Or so they claim. Most notably missing in the break are Team CSC and Predictor-Lotto. Cancellara was off the back of the field on earlier, but is back with the field now, more than 8 minutes behind the 15 with Predictor-Lotto leading. The gap is 6:40 when the peloton crosses the summit. Less than 60 kilometers/37 miles to ride. At the base of the big climb, both groups splintered. José Ivan Gutierrez of Caisse d'Epargne was the first to attack from the leaders, quickly countered by de la Fuente. Gerdemann and Fofonov bridged up individually, then dropped the two Spaniards. In the field, Cancellara quickly found himself off the back, and waved cheerily to the camera as he fell out of the race lead, in the gruppetto with Boonen, McEwen, Zabel, Wiggins and many others. Gerdemann quickly dropped Fofonov and led all riders over the top of the day's biggest climb. He had 3:30 at the top, and a 10-kilometer descent to the finish. Landaluze trailed by only 18 seconds at the top, but it looks like one of the early breakaway riders must win the day. Michael Rasmussen of Rabobank drives ahead of the field to make some climbers' points at the summit, taking 8th over the climb. Gerdemann is nailing the descent, fluidly stretching the gap back to Landaluze. It looks like Gerdemann will have a double victory -- the stage win and the yellow jersey. With 5 kilometers to ride, Landaluze trails by 32 seconds and the peloton is at 3:26. Gerdemann keeps his head down all the way to the line for the biggest victory of his career. He'll take over the yellow and white jersey leads, as well. Landaluze crosses 40 seconds back, then de la Fuente at 1:39. The select group with the GC threats was 3:38 back, with Juan Manuel Garate leading the way. For real-time updates, try my Twitter feed, which you can send to your instant messaging client or your mobile phone.